A spread of menu items at Eventide. 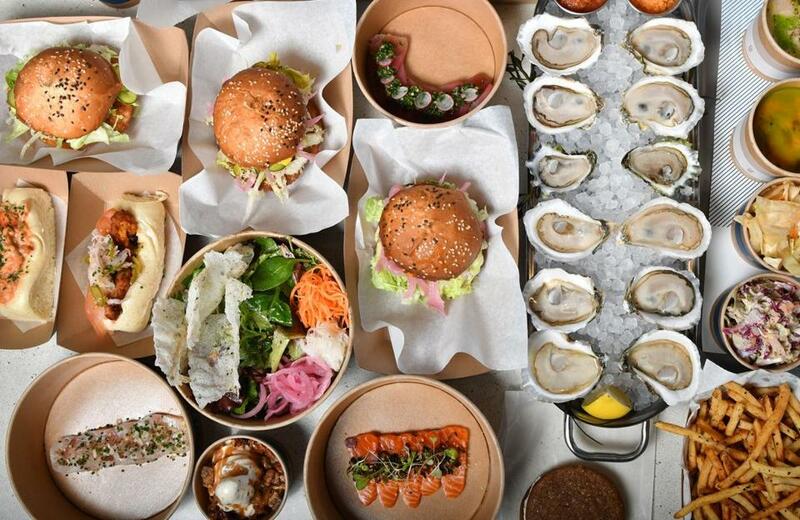 At Eventide Oyster Co. in Portland, people line up before the restaurant opens for its famed brown-butter lobster rolls, chowder and crudo, and so many Maine oysters you can order a dozen and have each be a different kind. Now there is an Eventide in Boston; the Fenway location recently opened. So: What should you order? And just as important, what shouldn’t you order? We are here to help. Two extremely hungry food writers settled in at Eventide Fenway one recent afternoon with a mission: Eat every item on the menu, and rank them in order of preference. (Well, almost every item. We skipped the specials. The curried carrots weren’t available. And we didn’t rank the oysters, because fresh, well-shucked oysters are never anything but wonderful.) Although our opinions diverged in places, the final results were clear. Without further ado: every menu item at Eventide Fenway, ranked from least favorite to amazing. Kara: Tasted like carbonated and liquefied burnt matches. We both sipped and scowled. It remained untouched for the rest of the meal. Devra: I’m dying now. My mouth is dead. Somebody forgot they were caramelizing sugar, and then they deglazed the charred remains of the saucepan and carbonated the results. There is no other explanation. Devra: Oily, flaccid cookies around a whole lot of cream. Leaves your mouth feeling like you ate a stick of butter, but that would be more satisfying. Devra: Yet more cream sandwiched between two dry layers with vague cocoa flavor. It’s the official state treat of Maine, but we’re in Massachusetts now, baby. Bring on the Boston cream pie. Kara: So much potential here. The salmon is pretty and delicious. But our serving was drizzled with what must have been burnt garlic — Was it garlic? Impossible to tell, it was so burnt — which was borderline inedible. Brush it off, and you had some fine pieces of fish. Devra: This is no way to treat good fish. Gorgeous coral slabs of salmon practically melt in the mouth, but they’re ruined when topped with burnt aromatics (yep, tastes like garlic; yep, so scorched it’s hard to know). There’s supposed to be yuzu kosho in the mix, but I don’t taste it. Kara: A cross between an overly sweet ginger ale and a daytime cold elixir. Devra: Too sweet, although I like the concept. The better of Eventide’s two house-made sodas by far (I loathe you, caramel cola), yet I wouldn’t order it again. Kara: This is a fan favorite, but I winced biting into this sandwich. The coating tasted burnt. Devra: Suffers from some very heavy frying. It’s a stomachache on a bun. Kara: Coated in pie crust. Little trace of corn. Ho hum. Devra: I appreciate the whole summer-in-Maine, corn-and-blueberry-pie gestalt here. But the ice cream tastes more like corn silk than kernels. Kara: Strange consistency here. If you prefer a mayonnaise-based slaw, this will be too thin. If you prefer a drier slaw, you will find it too wet. If you like a soupy slaw, you will be happy. Devra: I couldn’t feel more neutral about this. I don’t like or dislike it. It’s simply there. 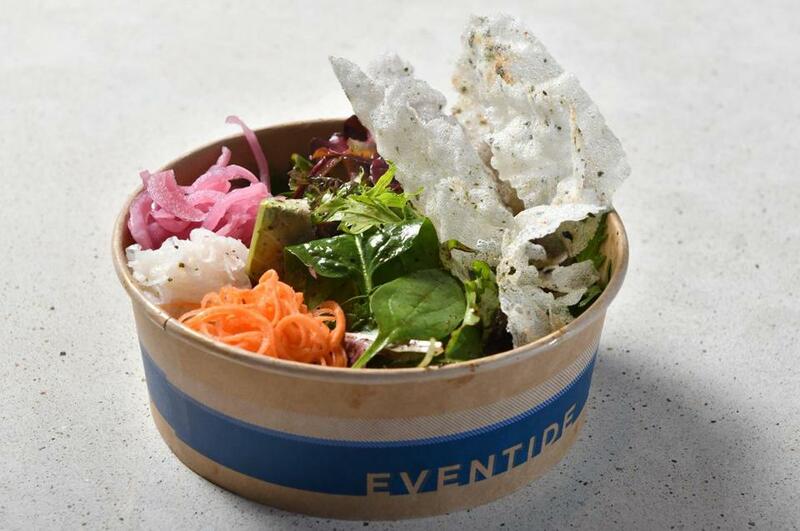 If you want a crunchy vegetable side at Eventide, you can do better: Read on. Kara: These tasted like potato chips, not nori-dusted ones. Devra: Again, I like the idea, but these have no nori taste and an earnest house-made-potato-chip texture. 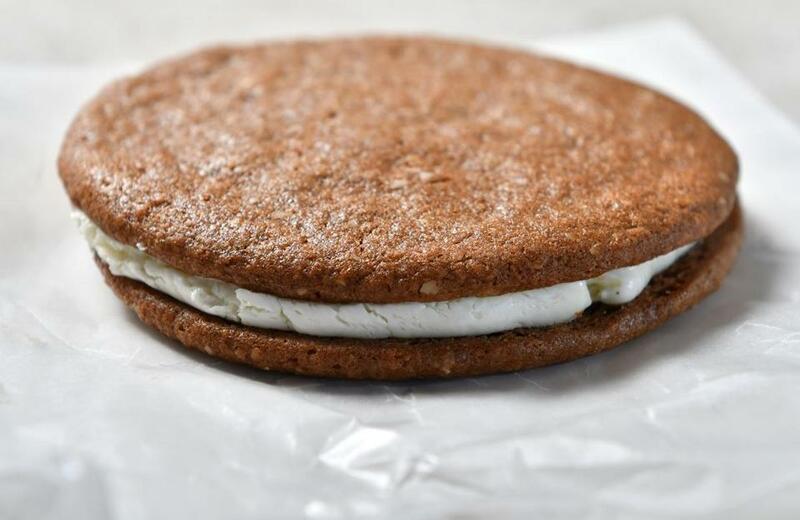 Give me that fine mass-produced-in-a-factory crunch, please. Kara: Aja, our awesome waitress, raved. I thought it was too stringy on the inside and too heavy on the outside. 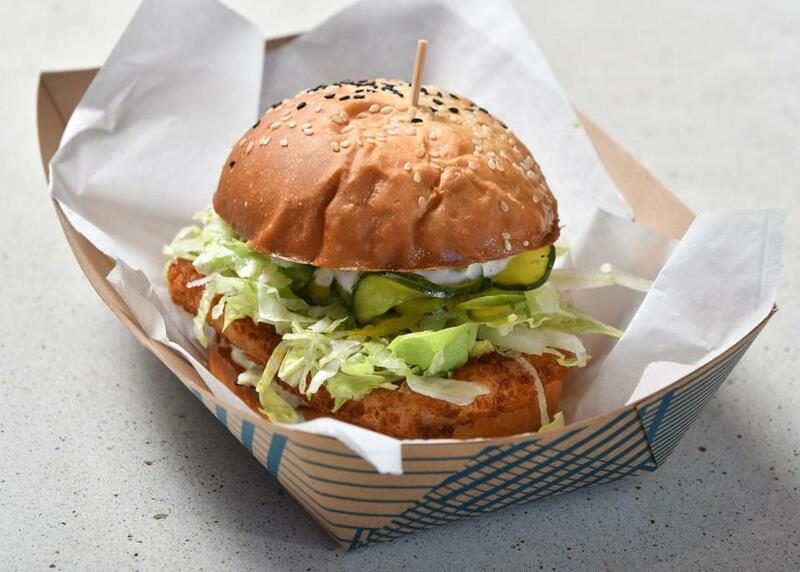 Devra: An otherwise good sandwich is marred by a too-thin cutlet. It’s all breading. Somewhere a Chick-fil-A sandwich is snickering. Kara: Notable for its pickled vegetables — a welcome palate cleanser when you’re hoovering fried food. Devra: I’m glad to have a salad here, and this one’s really pretty. I wishI could taste the nori vinaigrette better. But, like Kara says, the pickled vegetables herein are the perfect counterpoint to fried stuff. I’d order this over the coleslaw. Ditto the next item . . .
Kara: Tart, crunchy, another fine palate cleanser. You probably didn’t come here to eat kimchi, however. Devra: Nice crunch, happily sour, wouldn’t mind a bit more heat. There’s a faint but strange after-punch that reminds me of fake lemon juice. You want to eat it with something, and I can’t quite figure out what on this menu that would be. Kara: Who doesn’t like soft-serve? Didn’t get a strong brown butter flavor, though. Devra: I love the salty-sweet flavors.I also love that you can eat an entire meal here based around brown butter. Kara: Thin, crispy, vaguely salty. A fine accompaniment, and apportioned to share. Devra: No regrets. Crisp and salty. If you want fries, get ’em. Kara: Notable for a luscious layer of onion rings, glued against the bun with jalapeno mayonnaise like a crazy wig. I could eat these on their own, never mind the smoked tofu, which had the texture of a hockey puck. Tofu should be a sponge for spicy sauces, not encased in batter. Devra: I dig it. I was a vegetarian for years, and at a place like this I would’ve been stuck eating oyster crackers. Great heat and smokiness; the crisp onion rings inside the bun are the crowning glory. Kara: I prefer a creamy chowder; this version was too broth-like for my taste and also contained bobbling bits of fatty, salty pork. More clams and cream, please. Devra: I, however, love a thin, drink-y chowder. This one’s right up my alley. I got a nice amount of clams and enjoyed the wee potato cubes. If only the stringy pork chunks had been chopped a bit more. Devra: Lovely, buttery slices of fish topped with mysterious, too-crunchy puffed bits that look like they belong in a high-fiber cereal mix. Kara already told you about the maggot problem. (They are not maggots.) Needs seasoning. Kara: Superbly squishy bread, plus a generous portion of oysters, which Devra found heavy but I did not. Mixed pickles add a splash of tang; tartar sauce offsets potential oiliness. Devra: Encased in a squishy, boat-shaped bun we both love, this could have been No. 2 or 3 on the list if the oysters hadn’t been fried too long, dark brown and oily. Kara: Earthy and rich, withfine chunks of lobster. The menu advertises coconut and green curry — and there are droplets of the latter on the surface of the stew — but this had the caramelized qualities of bouillabaisse to me. Devra: Like the autumnal cousin of a lobster roll, in souped-up form, with chunks of wild mushroom and sweet potato. 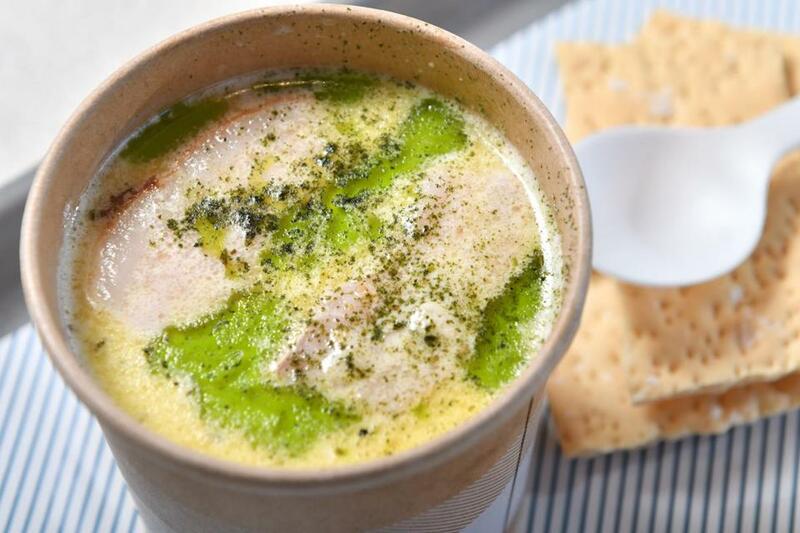 A cupful of flavor, miso-esque in its richness and depth. I don’t really taste the green curry in the mix, but I’m coming to terms with that. Kara: My notes say, “BETTER THAN A BIG MAC!” Appropriately saucy with the addition of gochujang-tallow mayonnaise, a tangy smear that serves as a fine fat mattress for the crunchy lettuce and pickles. Burger is juicy, maybe a touch salty, but overall a worthy alternative to seafood. Devra: I didn’t necessarily expect the burger at an oyster bar to be a standout, but it is. Gochujang-tallow mayonnaise adds richness and heat, and all that iceberg crunch is in context here. It’s what the Big Mac wishes it were in 2017. Kara: Bright, light, and thick, further enlivened by scallions, and not encumbered by gloopy sauces or drizzles. These slabs of fish can stand on their own. Devra: Classic and simple. Just really nice fish with soy, scallions, ginger, and sliced radish. Eventide’s best crudo by a bunch. Kara: I prefer my lobster rolls laden with glops of mayonnaise, not butter. But this was a pleasant surprise. Somehow, the meat still tasted creamy, just how I like it — and that squishy bread! It was light and rich all at once, like Wonder bread, but less embarrassing to eat as someone over the age of 5. I could consume 14 of these and still want more. Devra: The brown butter lends umami and depth, but it doesn’t overwhelm the flavor of the lobster. 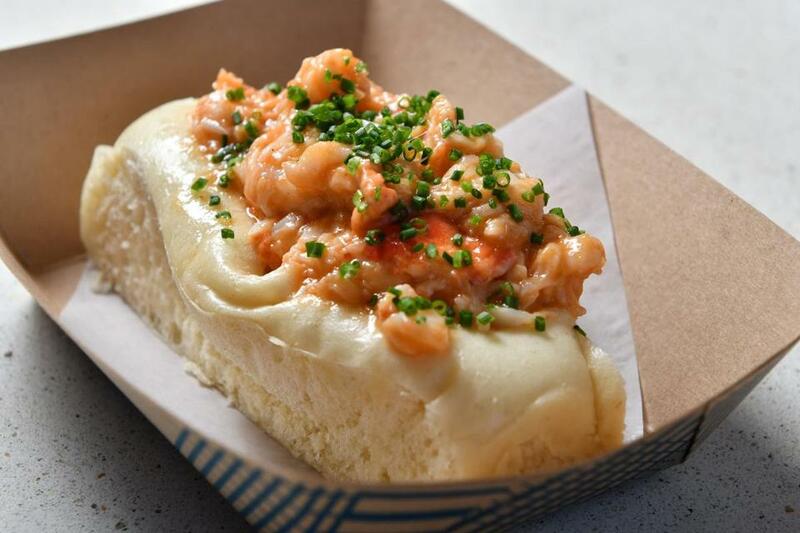 The steamed bun is sort of a cross between hot dog roll and Chinese bao, and it’s perfect. (There’s a gluten-free version, too; a friend declared it the best lobster roll she’s ever had.) Every bit as good as it’s cracked up to be. Devra First can be reached at devra.first@globe.com. Follow her on Twitter @devrafirst. Kara Baskin can be reached at kara.baskin@globe.com. Follow her on Twitter @kcbaskin.